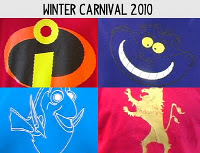 This year’s winter carnival was filmed, edited, and produced by Anna Doyle and Evan Arbour. It includes each grade’s talent show and hallway along with a montage of everything else. Winter fun for everyone! NOTE: If you are playing this DVD on a computer, use the arrow keys, not the mouse.